Wined and Grimed: W'Burg Oenologists Give "Hard Hat Tour"
Autumn in wine country is indeed idyllic: The vines heavy with ripe fruit, the mad bustle of the harvest, the thrill of the crush, the anxiety of the fermenting.... Yes, all that is great indeed, but wouldn't it be even better if the harvest came to you? More specifically, how about Williamsburg? 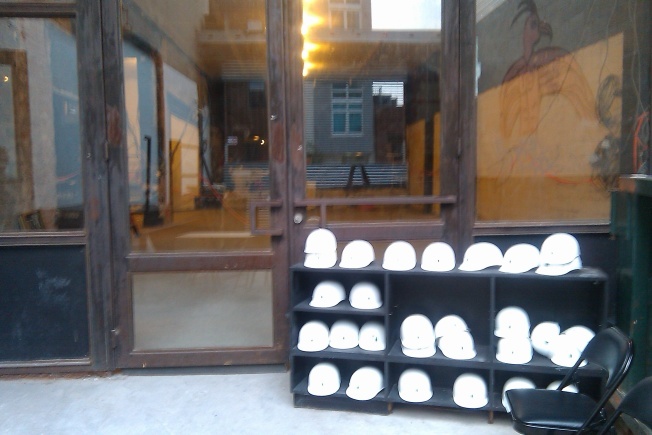 Last week, the doors of what will eventually be the Brooklyn Winery, but is now an active construction site, opened for buzz-inducing "hard hat tours." Located on North 8th and Roebling -- the block is an urban mix of industrial and residential (with a French bistro on the corner) -- the winery (distinguishable only by the temporary banner suspended above the door) attracted neighbors, curious passersby (a couple kids looking for the Modest Mouse concert stopped by to ask "are we in Williamsburg?") and maybe even a few folks interested in wine. The purpose of the hard hat tours was, of course, to promote the barrel ownership program, wherein you and twelve of your friends can buy a barrel of wine and, once the grapes have arrived (Riesling from the Finger Lakes, Merlot from the North Fork, Cab, Pinot and Chard from California), follow the year-long wine-making process from de-stemming to bottling. But, more importantly, CEO Brian Leventhal hopes that the open tours will establish the winery's relevance as a sort of winemaking community center -- differentiating them from TriBeca's City Winery, whose barrel program Leventhal describes as "less accessible" (in other words, more expensive). The winemaker-in-residence, Conor McCormack -- who Brooklyn recruited straight from Napa Valley (he was on the winemanking team at Crush Pad, the largest custom crush facility in the world) -- will be there full time to educate and ensure that the final product is something you will actually want to drink. If you'd rather get straight to the drinking phase, a tasting-room-themed bar with views of the 500-plus barrels (French Oak, American Oak, Toasted Oak, you name it) will keep evening hours and serve wine on tap. Tours are now being offered on Friday and Saturday (yes, you get to wear a hard hat) and the Winery is scheduled to open in mid-September.